As 2016 comes to a close there are still many amazing nonfiction books in my review pile. Freedom Over Me is one of those titles that rises to the top this year. Beloved author and illustrator, Ashley Bryan, based the book on an historical document: The Fairchilds Appraisement of the Estate from July 5, 1828. The document, which can be viewed in the back of book, lists eleven slaves and their prices along with animals and cotton owned by the Fairchild Estate. Bryan took inspiration from the document and wrote poems and painted portraits of each person listed. The first poem describes Mrs. Mary Fairchilds, a widow who is selling her family's estate which includes eleven slaves. On the following page titled "For Sale," Bryan paints the eleven slaves owned by the Fairchilds and labels the picture with names and prices. Historical deeds and documents are effectively layered behind the pen, ink and watercolor illustrations. Each poem brings to life a slave from the appraisement list. In the following poems, Bryan imagines the work, dreams and relationships of each slave. Stephen is 32 year-old carpenter. Readers learn that he secretly learned to read and is in love with Jane. The next page describes Stephen's dreams of being free, marrying Jane and building houses. The poems continue in the same pattern with a two-page spread introducing the person followed by two pages describing his/her dreams. Freedom Over Me is a powerful book that is a must purchase for school and public libraries. The poems beg to be read aloud in true Ashley Bryan style. Upper elementary, middle school and high school history teachers should read Freedom Over Me with their students. 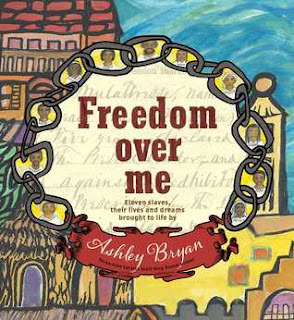 The poems and illustrations are sure to elicit important discussions about the history slavery in our country. Pair with Never Forgotten by Leo Dillon and Pat McKissack or I Lay My Stitches Down by Cynthia Grady. Visit the publisher's page to view pages from the book. Loved the illustrations--they were so beautiful!! 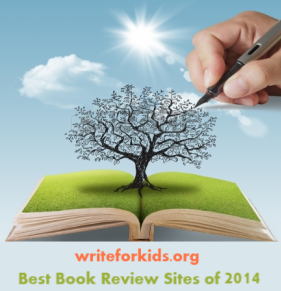 This book is a good example of the marriage of nonfiction and imaginative writing.